Smooch's new badge arrived in the mail this week from fetching tags. And she is ever so proud to wear it. These dog tags are off-the-charts cool, and I am totally hooked on them, which is a good thing, since it's Hooked on Fridays over at Julia's place. Go over there to see what everybody else is hooked on. And go over to the fetching tags website to see what all the fashionable dogs are wearing these days. They are hand made, will last forever, and you can have your own tag line stamped on the back. Smooch's tag arrived just in the nick of time. 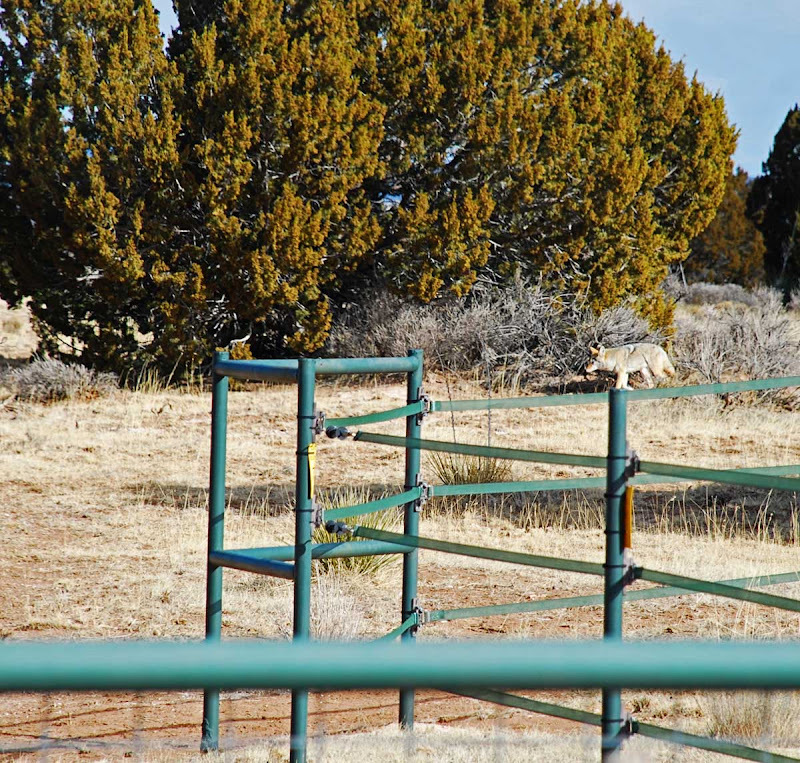 The coyotes I showed you a few days ago seem to have taken up permanent residence, and we see them every day. 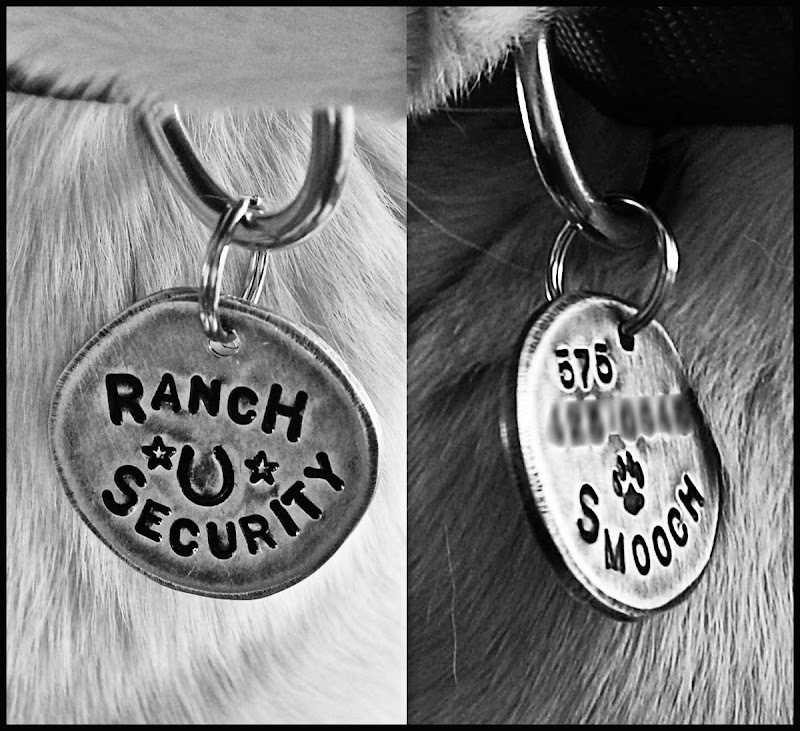 I've told Smooch to keep flashing her new tag and maybe they'll take her seriously when she barks out, "No trespassing!" You aren't kidding--those tags ARE way cool. I like the "Ranch Security" one! Sounds like you need it with those coyotes hanging around. I absolutely LOVE Smooch's tag and am going to check out that site ... Wally claims he needs a new tag now, and that is way better then his 'boring' Milk Bone one!!! Smooch is so cool, looks like she takes her new promotion very seriously! What adorable tags... now I know what to get Wrigley (my daughter's dog) for Valentine's Day! Hey, that looks awesome! ;-) I'm glad you found them, now Smooch is as stylin' as Cloud, heehee. Jen does an amazing job on those tags. Wonderful photo of the coyote through Smooch's ears! I bet you rest easy knowing Smooch is on the job. Great silhouette of Smooch. LOVE that tag, I'm heading over there for sure! With that coyote, keep the cats close. Those coyotes are hungry! Smooch takes her job seriously!! Good girl! Goodness, those ARE cool tags!! Love those ears!! 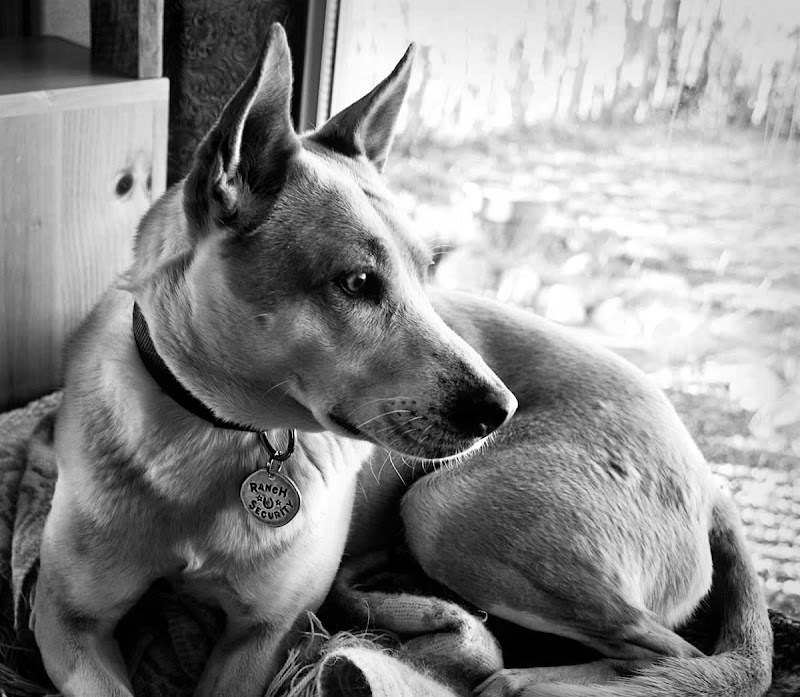 My Lucy is an Aussie Kelpie and she has those huge lovable, soft ears. Seriously about the cats. My parents lost one of theirs to a pack of coyotes a few weeks back. She had been with them on the farm for at least 8-9 years. She wasn't so young as to not be wise to them and not too old either. Keep a close watch on Smooch, too. We were camping on Blue Bird Mesa up by Cuba with Joey, our six year old 64 lb. American Pit Bull. A pack of 5-6 coyotes tried to lure him off in broad daylight with a female in season. They can be pretty cunning as well as lethal. Those are really great!! Love your ranch officer!! Love Smooche's new tags. I'm going to check out the site for my dogs. Hope she doesn't take her job too seriously and leaves the coyotes alone. Hmmm...those coyotes are getting pretty comfortable out there, aren't they. Smooch looks great in a uniform. Please tell Smooch that she looks the part, and that her new badges are great!!! Those tags are so adorable. I am loving them. The coyotes are such a problem it seems everywhere. My mother is having the same thing happen at her place right now. She has a couple German Shepherds that keep them back. I love smooch's new tag! That is the ulitmate in cool. I may have to get one for my horse's halter. (I lost my dog a year ago.) Love it. The coyotes may be a pair getting ready to breed. They may have found a den she likes on your property. Just a thought. Any worry about Willy and Wynonna with coyotes setting up housekeeping right in the area? Maybe it's time to put them nearer the donkey brothers?? I know coyotes will kill in broad daylight in our area. 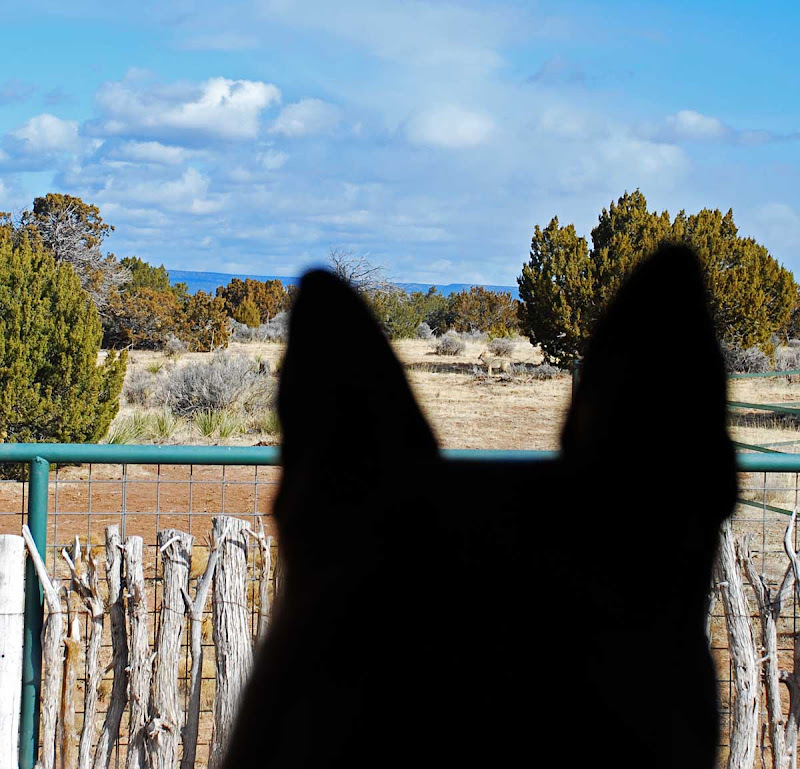 Ranch Security - ever heard of Hank the Cowdog? He'll have some tips for dealing with those coyotes. http://hankthecowdog.com/pals/hank.htm Just found your site off Pioneer Woman; oh boy, I'm coming back. Thanks, Ree.